From the genetic evidence, it appears that trans Atlantic crossings have been going on for a long time - the reddish/brown haired, green eyed Auracanians of coastal Chile and Peru not only have some 4-6,000 year old Indonesian genes in them (James L Guthrie), but they also have 12-18,000 year old Caucasian genes forming the basal layer of their complex genetic history. 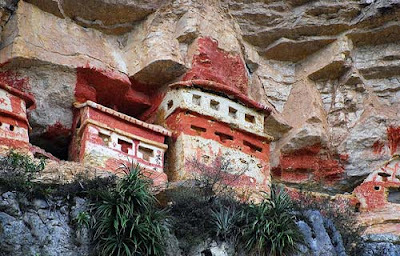 Aztec history confirms that Native Americans in ancient times were Caucasian. This period in history was called; "The Age of the Blonde Haired Bearded Giants". It was these people who made up the majority of Eurasian and American populations at the time when the kingdom of Atlantis existed - the mother of many European and American cultures. This period of human history ended with a terrible natural catastrophe. Historical records indicate that an earthquake destroyed an island in the Mid Atlantic(Atlantis) and an associated tsunami swept through the Caribbean (Anasazi legend) and down the Mediterranean(destroying the Greek army) 11,500 years ago and ended this "Golden Age". 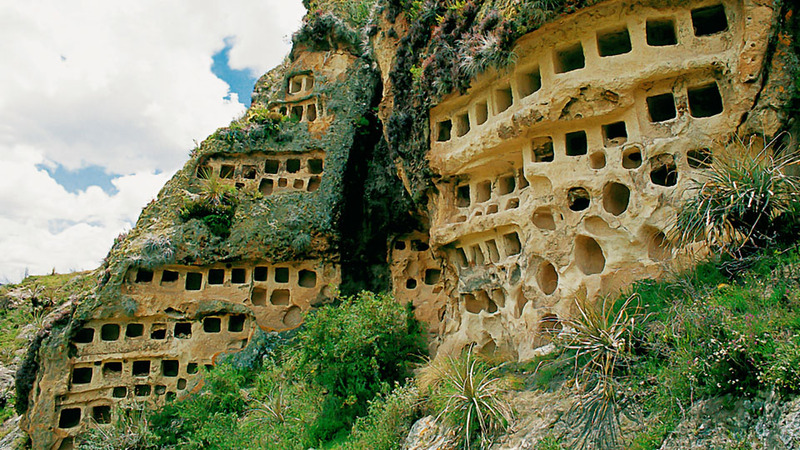 After the Golden Age - according to Aztec/Toltec history, 7,590 BC was the beginning of “Age of the Red Haired People." They enslaved the remnant populations of the blonde haired giants, using them to build their megalithic monuments. Cro Magnon man according to the Mayan 'Popul Voh' was very trusting and gullible. He was not familiar with the lies and trickery of this new breed of humans and was easily manipulated. The Mayan 'Popul Voh' is packed full terrible deeds done to these peacable giants. In Europe, the children's story of Jack and the bean stalk quite likely goes back to this time after Atlantis where the surviving giants of the 'Golden Age' possessed the knowledge of gold production, but the new breed of humans (the Red Heads) represented by Jack and his mother did not want giants around anymore, nor did they merely just want the giants stash of golden eggs, they wanted the technology of gold production, represented by the goose that laid the golden eggs, Jack succeeded in obtaining the 'technology of Gold production and then killed the giant. It is also interesting to note that giants in many fairy stories are depicted as being naive or easily tricked. According to Aztec/Toltec legend, 5,500 years ago, began "The age of the Black Haired People". Geneticists have identified that the East Asian migration into America began ~6,000 years ago. 500 years before American legends say it happened. This is an acceptable time period for the founder populations to gather momentum. It is interesting to note that Sumerian legends also state that the Age of the Black haired people in the Mediterranean began about 5,500 years ago. Obviously there was a catastrophe on a global scale and random chance favoured the Black Haired people. This is most likely the beginning of Austronesians crossing the Pacific via the Kuroshio current. Further proof that Native Americans prior to this time were essentially Caucasian is the 7-9000 year old red haired mummies that have been found in Nevada. Kennewick man, a Native American was also Caucasian, but not form Europe. The common origin of both European and American culture from the ancient civilization of Atlantis makes total sense when we start looking at the cultural similarities. Many books have been written about the similarities between Mayan and Egyptian science, especially in the realms of Astronomy, calender and mathematics. Mayans even share the same war god as many European tribes; Votan in Mayan legends and Woden in Viking legends, (Votan and Woden is deemed to be linguistically the same). One may ask; why is there not a greater degree of caucasian racial types evident in America today? This can easily be explained through the interaction between dominant and recessive genes. Once Asians began interbreeding with the Native Americans, the recessive genes of red hair and blue eyes quickly dissappeared. Despite this, there is still some evidence of this earlier racial type in some Native Americans. The Araucano appear to be one of the most significant remnant populations (300,000 in Chile) of this previous age of Red Heads in America . Elsewhere, native Americans have a lesser degree of this Caucasian heritage, although many Native North Americans are tall with long narrow skulls and wiry features - characteristic features of these early Caucasians. Most native Americans are blood group O (European) and not B(Asian). The Araucano are also 20% Rhesus negative, putting them up there with the Irish and the Basques as being the most closely related to the original Europeans. (Cro Magnon man was blood group O- and Rhesus negative). Not only is Rhesus negative a recessive gene, but blonde hair, red hair and blue eyes are all recessive genes and any interbreeding with dominant brown eyed/black haired individuals of blood group B, will lead to the dissappearance of these visual characteristics. Not only this, but due to isolation of these original Caucasians, they became vulnerable to disease brought in from outside America. This process was observed in the Pacific by the early explorers. First accounts of Tahiti indicated that over ten percent of the Population was Caucasian, but when another ship arrived 8 months later, most of these Native Caucasians had already succumbed to disease brought by the earlier European ship. Despite this, Polynesians placed these people in high esteem and they were often found in positions of power within Polynesian society. The practice of the bride withdrawing to a darkened hut or cave for weeks before her wedding day was to show she had some of this ancient royal blood and exemplifies the position these white people held in society. Ancient Caucasian genes have been lost in the Pacific and America, not through war or genocide, but through natural processes where the genetically stronger individuals become the dominant population. 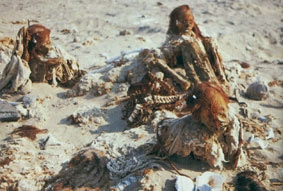 Thor Heyerdahls research uncovered a burial chamber that contained what is now known as 'The Paracas Mummies'. To his surprise, they had red and blonde wavy hair, with long skulls. These people conducted extensive ocean voyages off South and Central America on Balsa Rafts between 300 BC and 400 AD. 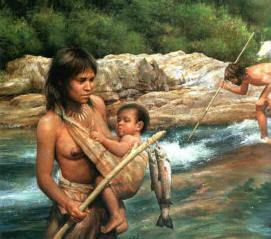 Their culture was undoubtedly South American in every way, but they were also a type of Caucasian. 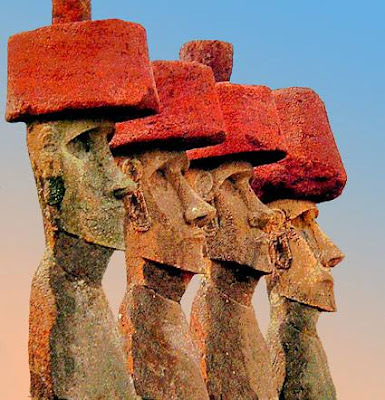 The Araucano would have been related to this group.There is also a high probability that the red haired long ears of Easter Island, represented by the Moai statues, are also from a similar gene pool as the Araucanians who according to James L. Guthrie, possess both Caucasian and Indonesian genes. The practice of elongating ears was common practice by mariners in the Maldives and Borneo and could have been a custom brought to America and the Pacific by people sporting Indonesian genes. More research on this early Austronesian long ear phenomenon is sure to uncover some interesting facts.